After the last deal alert, this one might feel a bit anticlimactic — after all, I did say that Samsung's smartwatches are the ones to buy if you're interested in that product segment. 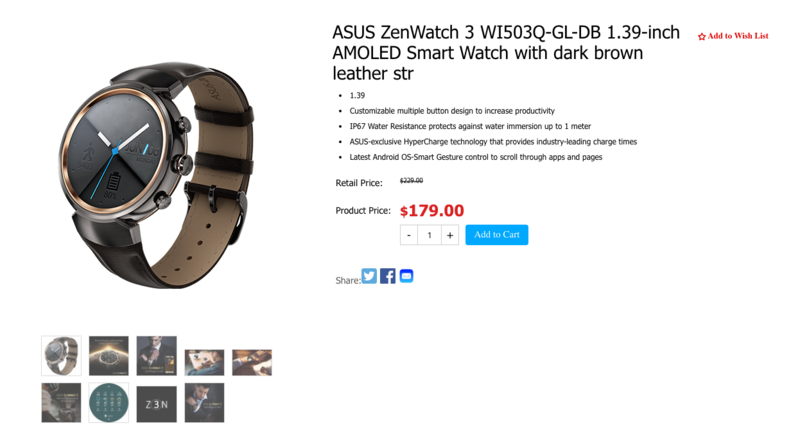 But if your heart is set on Android Wear, and bless your soul, then this sale on Asus' ZenWatch 3 might interest you. The best Android Wear watch is currently $179.99, a nice $50 off. Google's smartwatch OS is far from perfect, but the ZenWatch 3 itself is quite a nice watch. Not only does it look neat with its steampunk vibe and pronounced lugs, but it performs and does what it needs to quite well. You can go check out Ryan's review here if you want more information than that. Keep in mind that only the leather band options are on sale — the rubber watchband version is going for $204.99 on Amazon at time of writing. Luckily, you have plenty of wearables on sale right now to choose from, so good luck.